Facebook continues with their censorship of the right. First there was that Facebook skewed their news feed. Then reports of Facebook going after pro-Second Amendment groups. This mornng comes a new incident of anti-Trump censorship. The popular group God Emperor Trump was deleted with no warning or justification. The group featured Pro-Trump memes and humor. The group had over 90,000 “Likes.” They have returned already as Followers of God Emperor Trump. If you have not liked them yet, go do it! Let’s show Facebook we will oppose their censorship. Write support complaining and asking why they did this. 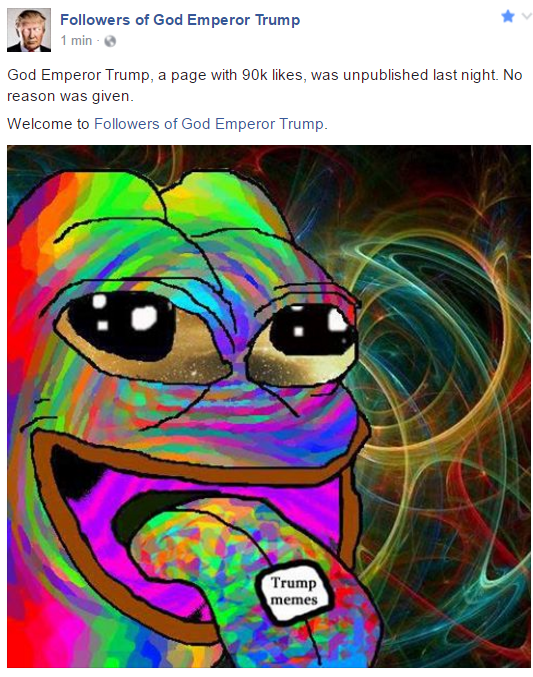 Go “like” the new Followers of God Emperor Trump so they get bigger than last time. Share this story and spread it around so that everybody knows.